Location/ Directions: Take I-80 East from Salt Lake City Airport and proceed to the city center. Exit on North Temple and travel approximately 3 miles to 400 West. Turn right on 400 West. About Hotel: 6-Floors, 128-Rooms, Interior Corridors, Pets Allowed (fee), Free Wi-Fi and high-speed DSL Internet access, 42" flat-panel HDTV featuring HD channels, sofa-sleeper, Coffee maker/tea maker, AM/FM alarm clock radio with MP3 connectivity, Large desk area, Two telephones (one cordless) with voicemail, Mini-refrigerator, Hair dryer, Iron/ironing board, Fitness center, 100% Non-smoking hotel, Outdoor pool and spa, Free Breakfast. Railroad View: Excellent View! Need a room on the rear (west side) of the hotel for a railroad view. This should be a busy location for train-watching. 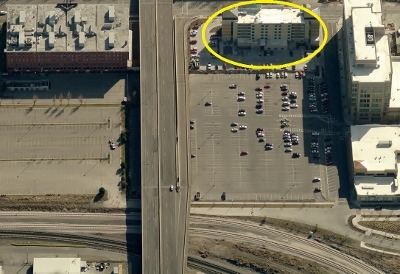 Photo Comment: The aerial photo shows the Hyatt Place circled in yellow, the railroad can be seen near the bottom of the photo. 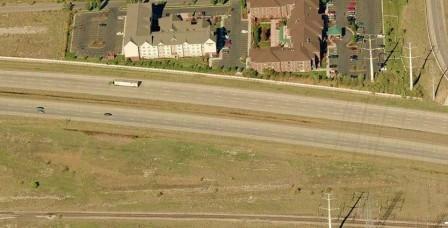 The two tracks closest to the hotel belong to UTA Commuter Rail network, the other two track belong to Union Pacific. Walking distance to UTA Light Rail - Arena Station at South Temple. 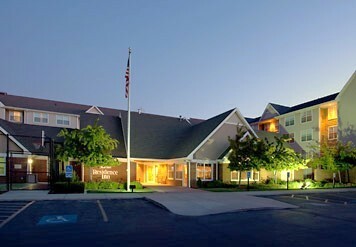 Location/ Directions: I-80, Exit #114 Wright Brothers Drive. Make an immediate left onto Douglas Corrigan Way. Hotel is on the left. About Hotel: 4-Floors, 104-Rooms, Interior Corridors, High-Speed Internet, Pets allowed (fee), Air conditioning, Alarm clock, Coffee maker/tea service, Crib, Individual climate control, Iron and ironing board, Rollaway bed, Hair dryer, Cable/satellite TV with HBO, Fireplace, Video games and players for rent, Conventional oven, Dishwasher, Microwave oven, Pots, pans, serving dishes, Refrigerator with icemaker, Silverware, Stove, Table and chairs, Toaster, Two-Line speakerphone with voice mail, Buffet breakfast, Coffee in lobby, Concierge desk, Evening reception, 24 Hour Fitness Room, Indoor Pool, Whirlpool. Railroad View: Excellent View! Any room facing Interstate 80 will have a railroad view. The single track line is located just across I-80. This is a active, but not very busy branch line. The end of the track is 1-mile west from this motel. Railroads past Hotel: Union Pacific, Local freights only. Photo Comment: The aerial photo shows the Residence in as the light colored building at the top of the photo. The single track railroad can be seen across Interstate 80, along the bottom of the picture.